When I moved to California, surfing was a hobby that I took to right away. While I’m never going to crush it on the pro circuit, I can do my best to represent in other ways. 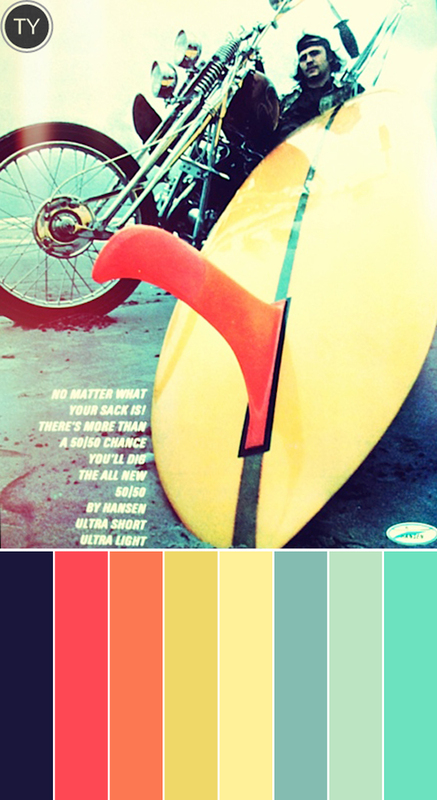 One way that I can do that is to find color inspiration that matches the vintage surf style that I love. 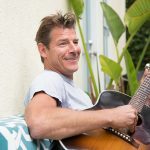 To bring that style into my own home, I was checking out books like Surf Shack and The History of Surfing that celebrate the aesthetic. 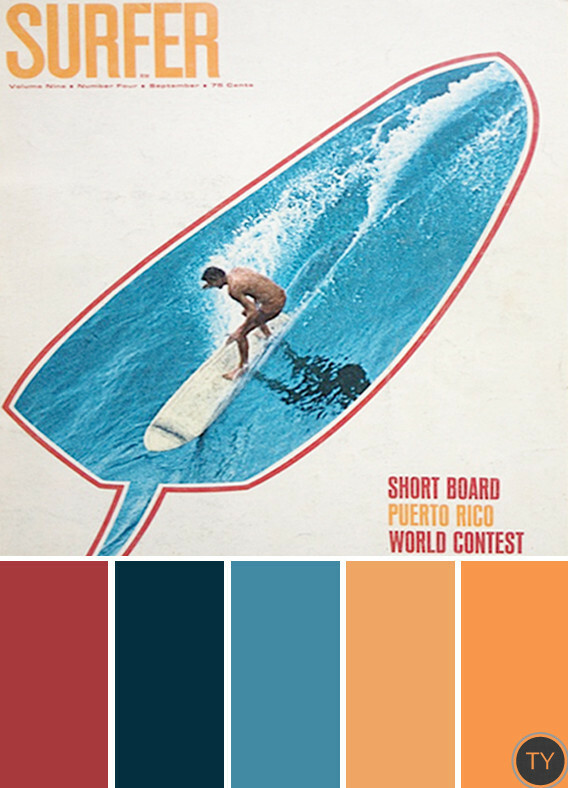 Then I matched some color palettes with the covers of old surf magazines for future project ideas. At first glance, you might think this is a pretty simple image. But the accent colors in the typography, center image, and borders make for a pretty slick palette. I’m a huge fan of the color orange, which really makes this palette pop, but stays true to the overall vintage feel with muted color tones. This next one is bold and bright; the perfect combination for the summer surf season. I can’t put my finger on it, but this color combination just screams Venice, California. The streets are filled with colorful murals, artists, art, and a thousand other reasons why I love living there. And last but not least, this strapping gentleman showing of his ride (and his girl!) 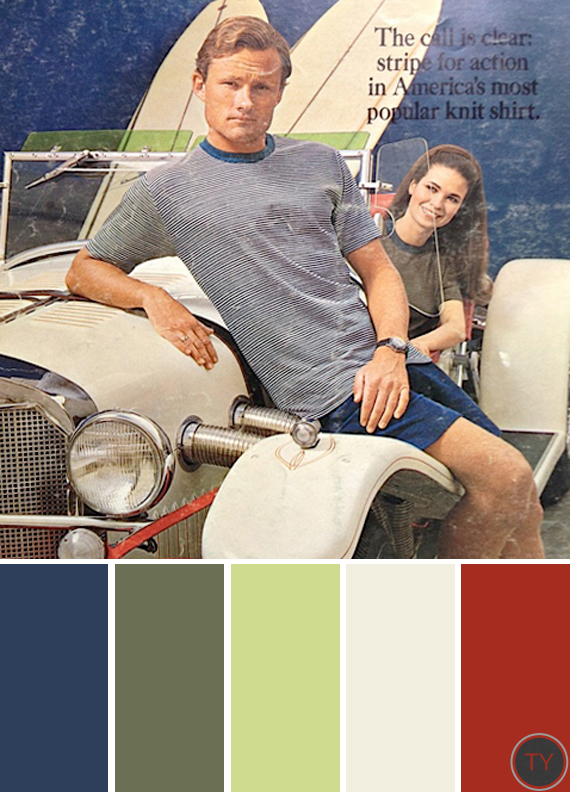 brings some earthy tones into this round of vintage color inspiration. Forest greens and navy blues harmonize well to give you that earth, wind and fire feel. Accent with red or maroon – using throw pillows, artwork, or other table toppers. So once you’ve decided on the palette that you are drawn to, you can make paint and fabric choices around that. 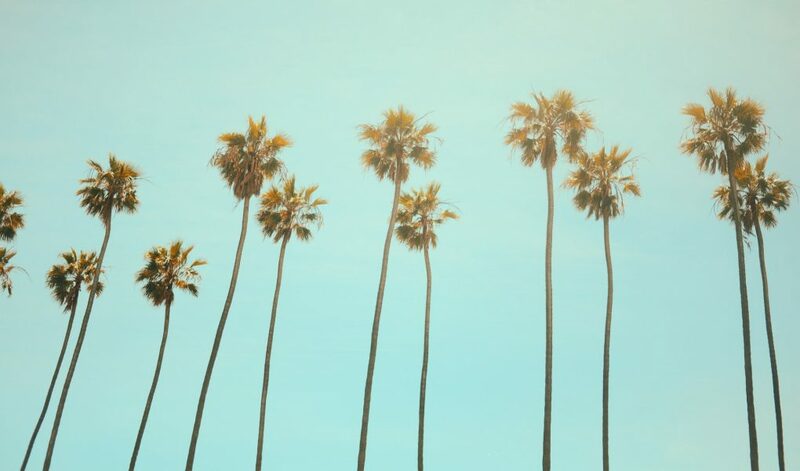 Accessorize with plants that mimic the palm trees you see in tropical and beachy locales. There are other ways that you can easily get to surf city with decor that will have you feeling salty in no time. While these are sure to emit a summer vibe, they are classic enough to be pulled off in any season. 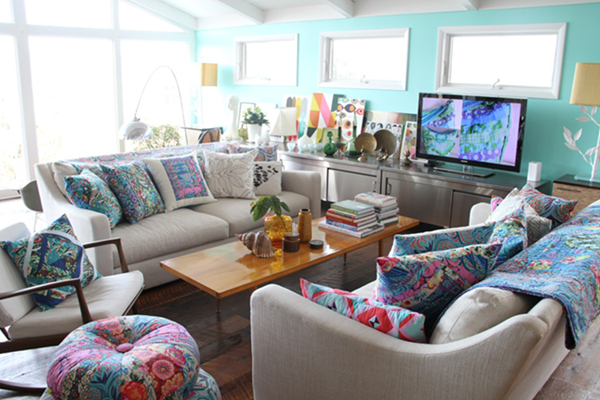 Consider other home decors that you can incorporate into your own surf shack – whether it’s suburban or seaside. 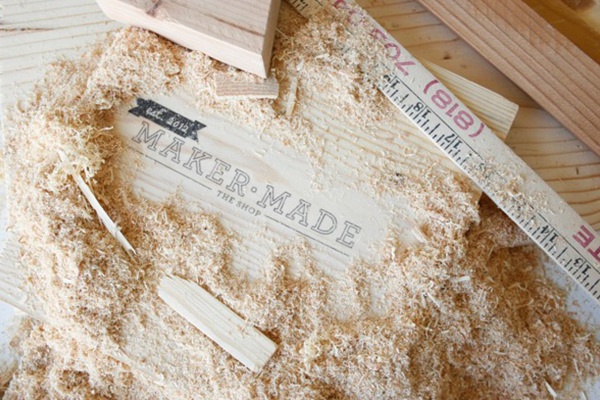 Pillows, blankets, or any other textile can give you options to swap in and out – no sand required!